Do you set aside time regularly to plan what you want to do in your business? If it’s not something you currently do, I strongly encourage you to embrace it for the remainder of this year! Setting aside a business planning session to decide what I want to do and, more importantly, what growth I want to achieve in the coming year has been crucial to my own success. Sometimes I commit to (and follow through lol) planning at the end of the year for the upcoming year. Other times, life gets in the way and I don’t get to plan when I want to. IMO, it doesn’t matter when you plan, as long as you make time to plan. So, we’re making time over these next 7 days, together. Over the next seven days, I want to share some of what I’ve learned and what I’ve found helpful with you. First things first. 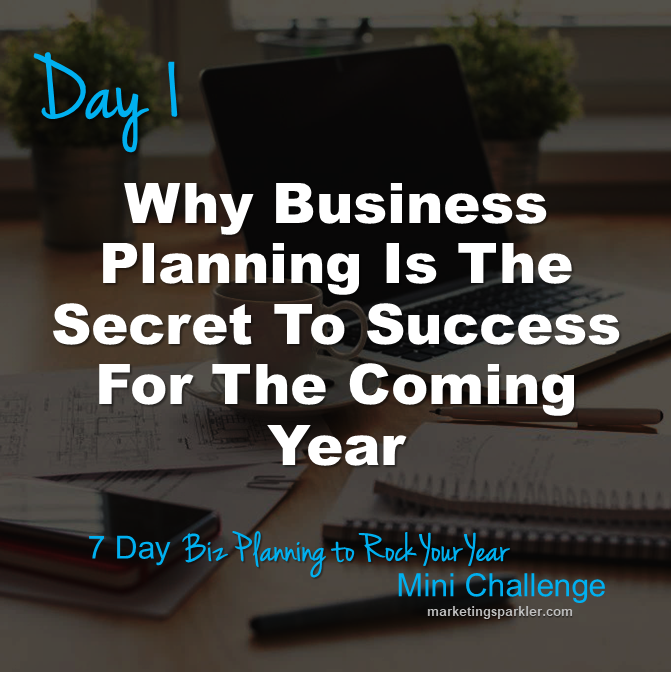 Let’s start off by reminding ourselves why business planning is “the secret” to success. There are a few different factors that come into play here. The first is efficiency. When you go in with a clear plan, you can focus on what’s most important. Instead of spending time trying to figure out what you should be working on, what pieces of the puzzle are missing from your product funnel, or what you need to do to break through to the next income level, you know exactly what needs to come next. As we’ll explore in a future blog post, with a clear goal in mind and a plan for the year, it becomes easy to walk backwards to create effective and efficient daily to-do lists. Work on what needs to get done each day and you will reach your goals. Next, setting a big goal for yourself helps you think outside the box. If you don’t believe me, try it. Decide on a big income goal for the coming month. Write it down. Keep it in front of you. Then get to work and start to notice what happens next. First, you begin to think of things that didn’t occur to you before. For example, you’ll come up with creative ways to get more traffic. You decide to run a fun promo that adds dollars to your bank account. The same happens when an important deadline comes up unexpectedly. Think back on that time in school when finals rolled around, or the last time your in-laws told you they would stop by later in the day. You got very creative about studying and cleaning, respectively. Last but not least, let’s talk about the subconscious. So far we’ve been focused on what we are actively doing to make progress by making a plan, setting goals and following through. There’s another dimension to all this and that’s what’s going on in our subconscious mind. While we are busy plowing through our to-do list, cooking dinner for the family, and even sleeping, our subconscious mind is working towards those goals as well. In short, planning and setting goals is important because it helps you grow faster. That means you end up with more money for yourself and your loved ones, while spending less time slaving away at your desk.